A group of townspeople become trapped in a grocery store when a mysterious mist mystifies Small Town, Maine. If the mist isn’t creepy enough, the town becomes engulfed by police cars, fire trucks, and military vehicles. Nobody seems to understand what’s going on, but when an alley cat is abruptly slammed against the storefront glass window, a grocery store clerk attempts to flee the market, and is sucked away by a beastly sea monster with limbs, teeth, and tentacles. Since the air is opaque with the mist, it is hardly conceivable that either incident occurred. Of course all sorts of conspiracy theories fly—one woman (a religious zealot, of course, played by Marcia Gay Harden) attempts to convince half the terrified crew that the mist is a sure sign of “the end times” and God is punishing everyone for their sins. 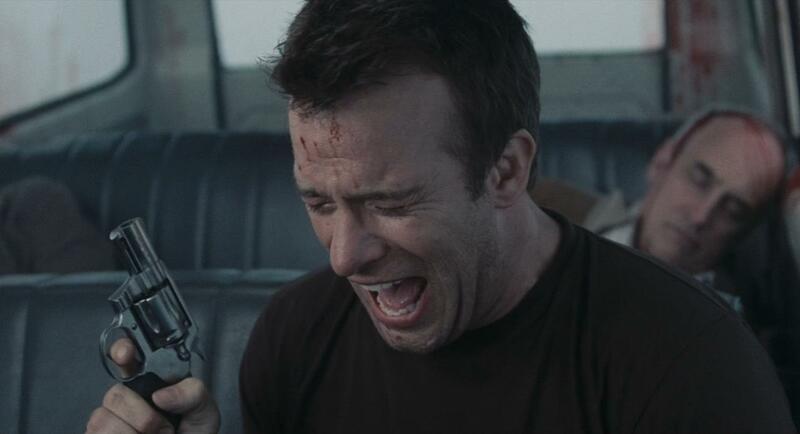 The other half of the crew, led by “local artist” Dave Drayton (Thomas Jane) and his family, challenge the others’ beliefs and brave the mist to escape and, hopefully, receive some answers—only to discover more than what they “bargained” for. Stephen King’s “The Mist” first appeared in print with the likes of literature from Ray Bradbuy and Joyce Carol Oates in a short story anthology, Dark Forces (1980), and again in King’s own collection, Skelton Crew (1985). A juxtaposition of George Romero’s Crazies (1973) and Matt Reeves’ Cloverfield (2007)—and possibly every military experiment/monster based movie in-between—Director Darabont dazzles the audience with another King adaptation of the same name for the third time in 14 years (his other two King cinematic successes being The Shawshank Redemption and The Green Mile). Despite the familiar storyline, many of the extreme talents of Darabont are real character portrayals and special effects. Darabont successfully relays King’s recycled idea about secret military operations and terrified townsfolk who want to be “in the know.” It doesn’t hurt, well last least for the reader, that King methodically and progressively includes a ferocious military-made monster to baffle the locals, and cause the habitual King fan to customarily jump out of his or her skin. Of course what one may think dazzling, another may deem repetitive—read Roger Ebert’s review on how he thinks Darabont “picked the wrong story this time,” as it doesn’t nearly compare to Darabont’s other adaptations. Although Ebert further contorts that the “science fiction” story is overplayed and the characters are “cardboard,” he doesn’t disagree that Darabont’s special effects—the mist and monsters—are “gruesome and slimy.” I am almost certain that Stephen King fans will concur. The film is inspired by the (1950s) EC comic books” and is segmented in five different parts: ‘Father’s Day,’ ‘Lonesome Death of Jordy Verrill,’ ‘Crate,’ ‘Something to Tide You Over,’ and ‘They’re Creeping Up On You’ (StephenKing.com). In true comic strip fashion, using exaggerated 50s horrific elements (creepy bugs, overgrown plants, voodoo dolls, evil doctors, ferocious monsters with jagged teeth)—meshed with cartoon-like camera shots, cinematography, and sound effects—King and Romero join creative forces to bring the audience one of the most originally comical horror films of all time. For anyone who is unfamiliar with the comic book world, EC (f.k.a. “Educational Comics”; n.k.a “Entertaining Comics”) is the quintessential comic book series, “specializing in horror fiction, crime fiction, satire, military fiction and science fiction from the 1940s through the mid-1950s, notably the Tales from the Crypt series” (EC Comics.com). 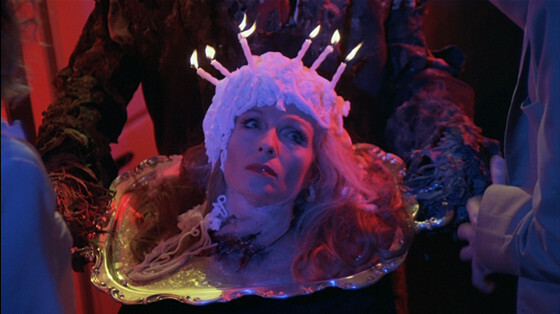 “Stephen King and George A. Romero welcome you to Creepshow 2!” reads one tagline of the second ghastly installment of the fearsome, yet slapstick, horror films. The dynamic auteurs of gore once again join forces and create a second comedic effort to pay homage to the horror comic pioneers at EC Comics (see Creepshow entry). Episodes include “Old Chief Wood’nhead,” “The Raft,” and “The Hitchhiker.” George A. Romero adapts “The Raft,” which first appeared in King’s short collection, The Skeleton Crew (1985), and drafts the other two stories (written by King) into this spectacular screenplay directed by Creepshow cinematographer, Michael Gornick (IMDb and Stephen king.com). Many reviewers have differing opinions about the quality of the film, which is surely just to parody the exaggerated drama of the horror genre, but the general consensus is that each story is progressively better than the next. The basic fears of any human are expounded in all three stories. In “Old Chief Wood’nhead,” the audience discovers another King character/prop favorite: an anthropomorphic object in the form of a wooden “Indian Chief,” which “come(s) to life and avenge the death of two elderly Arizona store owners” (ReelReviews). Essentially, nobody is thrilled to witness inanimate objects, in the middle of the desert, become vengeful and murderous. In “The Raft,” four stereotypical teenagers are trapped at the river and are threatened by a gargantuan, blob-like creature. This episode is probably the most over-played scenario of the horror genre, but the outlandish props and outrageous acting reminds the audience that the Lochness will always live in our imagination. Lastly, in the “Hitchhiker” a bored housewife, who ventures in the night to fulfill her lonesome needs, accidentally runs over a hitchhiker on the side of a dark, lightless road. She flees the scene, only to be constantly traumatized by the dead hitchhiker’s recurring, bloody figure. Moral of the story: be true to your man and nobody will get hurt! An innocent family of four moves from Chicago to Maine—the establishing shot is a perfect setting for any nuclear family. The family learns a few things about their new home: a). the narrow road on which the home was built is constantly occupied by speeding semi-trucks; b). a pet cemetery was built, practically in the family’s backyard, by children of the area so they can lay their pets to rest after they are hit by one of these fast-moving big rigs; c). the entire area is built atop an “ancient” Indian burial ground. Unfortunately, the first to go is the family’s pet cat, Church when it becomes deceased after it meets its metal-framed maker. Dr. Creed (Dale Midkiff), an educated father and husband buries the cat in the cemetery beyond his house. Mr. Creed’s elderly neighbor (Fred Gwynne—Munsters and My Cousin Vinny) escorts him to the burial spot, but warns him about its deadly secret. Soon after, the pet rises from the dead, and is vastly different: pupil-less, yellow eyes; sharper teeth; and meaner demeanor. Thereafter, another tragedy befalls the family when the Creed boy’s life is taken on the same highway of death. Mr. Creed buries him, as well, but believes that he can revive the boy by burying him the ancient burial ground—his assumptions only lead to fatal murders, conducted by the ghost boy and his team of zombie pets. 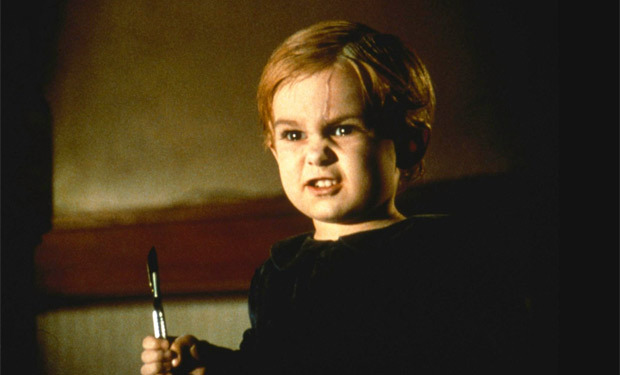 Die-hard Stephen King devotees believe Pet Sematary (purposefully mis-spelled—think semi-truck and cemetery) to be one of the scariest horror movies in film history. Other critics have their fair share of reviews, calling it “bland, cliché’d, and cheap”—but what “B-rated” horror movie from the 1980s isn’t? Nevertheless, for a Stephen King screenplay, the film world wasn’t entirely impressed by the atrocious acting (even with Stephen King as a Preacher), nor the defective direction and preposterous musical score of Mary Lambert, as they had been with de Palma (Carrie), Kubrick (The Shining), and Reiner (Stand By Me; Misery) (The Washington Post). Others begged to differ, praising Lambert for actually getting “[King’s] story. . . by remaining faithful to the source material” (Dread Central). The fact that the director stayed true to the text—unlike Kubrick or Reiner had in The Shining or Misery—is an important aspect of adaptation. As mentioned earlier, it’s near impossible to translate everything from a 300+ page novel, but to capture the essence of a work is crucial—Lambert did that for this movie. The establishing shot—millions of swirling birds ascending into the heavens—is quite akin to the familiar Hitchcock classic, The Birds, and a premonition of catastrophe, rage, and/or violence. The first scene cuts into a boy, his room, and his writing tablet. A significant “Black Beauty” pencil and subsequent jump cut to a “Slow Death” comic book dominate the scene and foreshadow later instances. Although doctors supposedly remove the tumor, which grotesquely consists of human parts—one eye, few teeth, and some hair—in perfect Romero-fashion, the audience is re-introduced to the birds—this time swirling in the dark, gloomy backdrop, some of them smacking into hospital window—while a nun and two nurses gasp in disbelief. This first scene is an atypical scenario, yet reminiscent of King himself, especially to the reader who has perused the author’s memoirs On Writing. Even the boy’s mother is spot-on as King’s mom. Thus, the “auteur of gore,” George A. Romero, directed the King adaptation, The Dark Half, the same year it was written. 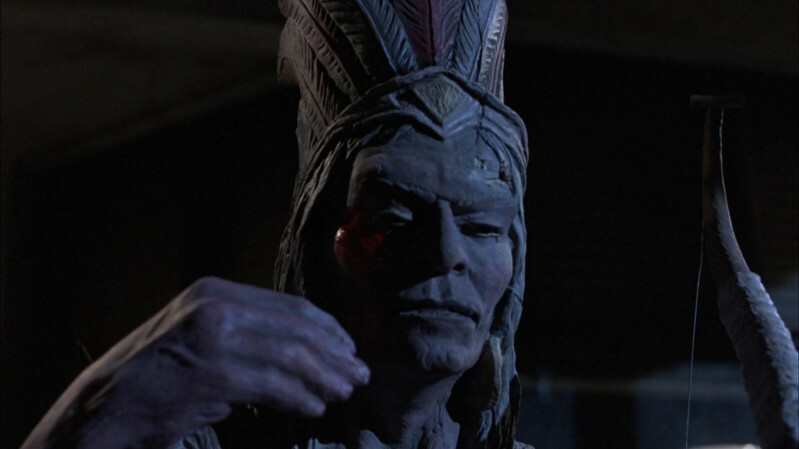 Romero’s intelligent, inter-textual homage to Alfred Hitchcock infamous cross-cut editing and prop placement of the mise-en-scène, flash-forwards twenty years when the audience is introduced to the adult Thad Beaumont (Timothy Hutton)—Bingo! He’s a Creative Writing College Instructor/Aspiring novelist —who has a secret, yet infamous, pseudonym, George Stark (also Timothy Hutton). The audience is only privy to the vanilla author’s bland prose, plain wife, and two young twins until 20 or so minutes into the film—when a snarky, scrawny journalist threatens to expose Beaumont’s supposed double-life as a critically acclaimed author. Beaumont decides it’s time to put the pseudonym, who happens to be a spunky, cigarette-smoking alcoholic with a vengeful heart and a mighty pencil—to sleep, but not without paying the horrific price of “slow death” for almost every character involved. The jagged love-hate relationship between Beaumont and Stark foreshadows another King horror adaptation (Secret Window), but should not at all be misconstrued as Stephen King’s lesser known pseudonym, Richard Bachmann—wait—or should it? Prolific and well known “author”—really, no joke—Paul Sheldon (James Caan) probably never would have received a second chance at life if it wasn’t for his guardian angel, Retired Nurse Annie Wilkes (Kathy Bates). After the fatal car accident that left him near dead in a dense, Colorado wood, the serial novelist is hauled back to a wood-burning “cabin,” hidden by the snow and any other inhabitant, by his number one super-fan. Annie nurses Paul back to health, but not without him paying the ultimate price. See, Sheldon writes stories about a beloved character named Misery. Paul decides to finally put the character out of her “misery,” which immensely displeases his number one fan. Thus, while he is recovering from his fatal wounds, he finds himself in the lucky situation of re-writing the last book’s ending to Annie’s liking. Paul is attempting to revive the life of Misery, while simultaneously fighting to survive his own, all the while depending on the very woman who threatens his existence. King’s novel, written in 1987, was adapted a few years later by the great and versatile Rob Reiner (Stand By Me; Sid and Nancy; The Princess Bride). Although the film acquired a plethora of awards, Stephen King was discontent. Once again, an attempt to translate a four-pound brick book into an inhibited amount of space takes an act of God. Therefore, Rob Reiner adapted the most important sections feasible to stave the hunger of the horror film audience. One of King’s greatest friends, William Goldman, wrote the screenplay for Misery. Alongside director Rob Reiner, Goldman was proud of the reproduction, which, in his eyes, was made for screen. 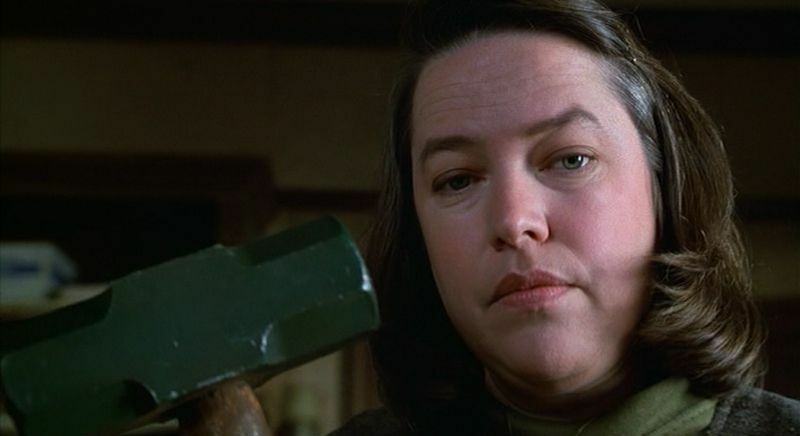 King, however, was displeased with the casting (James Caan) and the fact that the main character, Annie Wilkes (Kathy Bates) only “breaks” the author’s ankles with a sledge hammer instead of axing off his feet, as is done in King’s novel—a slight detail King did not appreciate. 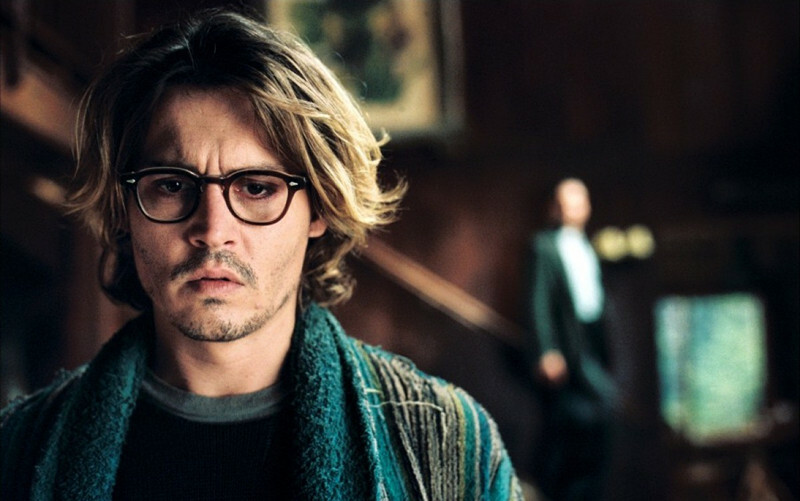 Nevertheless, the film has been included on many top notch lists, is raved to be one of the scariest movies of all time, and is an antecedent of the next film on the list, Secret Window. “The most important part of the story is the ending. This one is very good. This one is perfect…” echoes Mort Rainey, author and protagonist of the film Secret Window—or shall he be called a “plagiarist”? Stephen King’s novella, ‘Secret Window, Secret Garden,’ first appeared in Four Past Midnight (1990). He writes, in detail, about his inspiration for the novel on his author’s website (Stephen King.com). Part of his creation included a small basement window, which gazed out into a “charming garden” of his house. He discusses his creation of merging his two other story types (Misery and The Dark Half) and viewing these narratives from a different angle—or window’s angle, in this case. The story, not necessarily a sequel to either previous novel, includes fantastical elements conjured in the author’s mind, and how those components can be shattered when a negative force disrupts the creative writing process. Thus, in the film adaptation, King’s words spring to life. The elements that King describes in his novel are aesthetically visualized when the viewer is able to witness the author’s process on screen. Rainey’s “secret window” is his mind, which is only unlocked (or opened) during the writing process. He is fixated on the ending, and knows that once this occurs, he will not only accomplished his objective, but open the hearts and minds of his readers. However, Mort Rainey’s fantasy world turns awry when he is abruptly approached, in his home, by an unadorned man who accuses the author of plagiarism. The versatile Mr. Johnny Depp plays the accused authorial figure in this all-star cast, which includes John Turturro (John Shooter, the accuser). The talented Maria Bello, who isn’t a stranger to King’s adaptations (Under the dome) plays Rainey’s estranged ex-Wife, while Timothy Hutton, another King favorite, more specifically—and most certainly deliberately—the star of The Dark Half, plays Bello’s lover. Rainey is convinced that the story he has written is his best thus far, and everyone loves a great ending, but I’m certain nobody enjoys being accused of stealing. John Turturro (O’ Brother Where Art Thou? and Transformers) not only details Rainey’s story, but provides him with an unbelievable created manuscript from which Rainey compares, verbatim, his own creation. The evidence of Misery and The Dark Half surfaces through Shooter, who unilaterally becomes Rainey’s real-life, warped “alter-ego” (think George Stark), insists that Rainey complete “his novel” (think Annie Wilkes) his way. A writer’s worst nightmare comes equipped with an axe, shattered car windows, and a southern drawl.